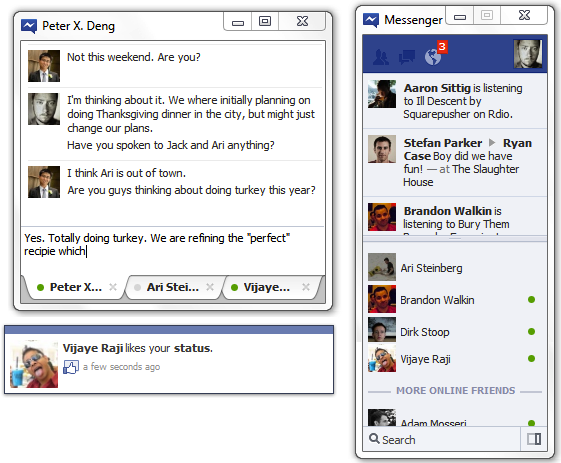 The test group for “Facebook Messenger for Windows” just got a whole lot bigger. Israeli blog TechIT has leaked a Facebook CDN download link for the desktop chat client Facebook began testing with a small number of users last month. The client includes notifications and the Ticker which link back to Facebook.com, and therefore could drive engagement with the website. Messenger could also pull market share away from other desktop chat clients like AOL Instant Messenger and Windows Live Messenger. I just tested the Facebook Messenger for Windows client version 2.0.4373. It’s snappy and functions intuitively. It can float or easily be snapped to the desktop’s sidebar. Similar to the standalone mobile Messenger apps Facebook released this summer, frequently contacted friends automatically move into a favorites section above the complete list of friends who are online. My only gripe is that the log out button is relatively hard to find. AIM and Windows Live Messenger should be worried. Sorting through a buddy list of cryptic screen names can’t match the user experience of an authenticated identity chat client. Facebook’s client also delivers messages to whatever device a recipient is currently using. That means even if a recipient isn’t currently logged in, they’ll easily be able to access their messages. AIM and Live Messenger will still be useful for staying in contact with internet pals who aren’t your real friends, but Messenger for Windows seriously reduces the unique value of these services.Clients that handle chat across different platforms exist, but to work with Facebook they take configuring that can confuse and deter mainstream users. Facebook could potentially kill the download link to prevent the app from reaching more users before its official launch. So, if you want it, download it now. Even then, Facebook could release an update to the app and cease support for this leaked version. However, this would interrupt its test and force those it actually wanted to give access to to re-download.